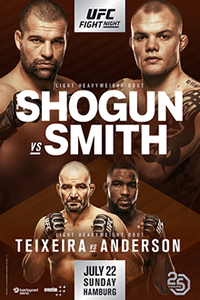 • Mauricio "Shogun" Rua vs. Anthony Smith: Anthony Smith def. Mauricio Rua via KO (strikes) at 1:29 of Round 1. • Danny Roberts vs. David Zawada: Danny Roberts def. David Zawada via split decision (29-28, 27-30, 29-28). • Damir Hadzovic vs. Nick Hein: Damir Hadzovic def. Nick Hein via split decision (29-28, 28-29, 29-28). • Nad Narimani vs. Khalid Taha: Nad Narimani def. Khalid Taha via unanimous decision (30-27, 30-27, 30-27).